S4 Tech-Tips provides suggestions for users that can save time, discover new ways to use the S4, and tips you can use every day. Our goal is to enhance safety and security for you, your family, and belongings. We encourage readers to send us additional suggestions that can be added to S4 Tech-Tips. We suggest moving the App to your Home page. Using Lists, tap S4 nickname, tap +, tap SMS, in Template Name enter GPS, tap Done, in Recipients tap +, tap your S4 name in your Contacts list, tap message, tap Templates, under Message enter YourPIN gps [YourPIN is your secret 5-digit PIN. Leave space after PIN.] tap Done, tap Create, tap Lists. If you have additional S4 units, just repeat the process using a new S4 nickname. Using S4 nickname, tap the message you wish, and tap the green arrow. The App sends the message. 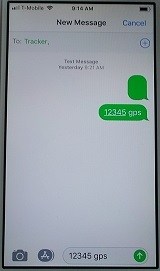 When the S4 responds, the message will show briefly in the top Notification panel and the full response appears in the normal Messages screen. If you are parking your vehicle at the airport, put the S4 in master mode and then put back into guard mode when you return. S4 will notify you if the vehicle is moved more than 2-3 blocks even if it is “hot wired”, taken by use of a duplicate key, or is towed. If your friend borrows your key and moves your car from one spot in a large parking lot and then forgets where they parked when they returned, just ask S4 for its current gps location. If your vehicle has an emergency or a crash, the driver can turn off the key and sound the horn for at least 8 seconds and S4 will send a vehicle alarm to the owner (and authorized emergency contacts). This assumes you had the yellow wire connected to the vehicle horn during the installation and that your horn does sound with the key off. If you are concerned that your car battery is getting low while the car has been sitting for several days, just ask S4 to send you status. The S4 return message tells the voltage. If the voltage is less than 11.5V, the battery is getting low enough that the car needs to be started soon. If your car has been sitting for many days, S4 will automatically send you a low-battery notification when the car battery gets down to 11.0V. If a family member is traveling with your vehicle and you would like to know if they are parked and the ignition is turned off, just ask S4 to send you status. The return message will tell you if ignition is ON or OFF.If a family member is traveling with your vehicle and you would like to know when the vehicle starts moving again, just ask S4 to go into master mode. When the vehicle moves more than 2-3 blocks, S4 will send you a moving notification. 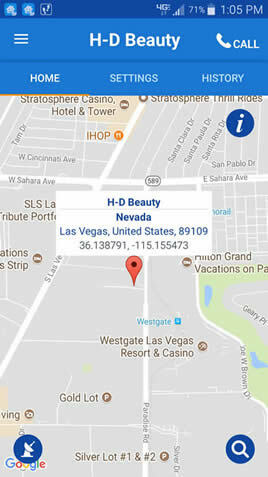 If a family member is traveling with your vehicle and you would like to know their location but they have driven into a remote area that is not within range of a cell tower, just ask S4 for its current gps location. The cell carrier system automatically keeps trying to deliver the message. As soon as the vehicle is driven back into a cell coverage area, S4 will receive the message and respond with the current location. If you have a teenager or other family member that is tempted to drive when they aren’t supposed to, send S4 the text YourPIN relay on. 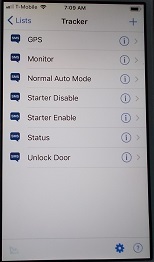 S4 will disable the starter. Note -- This assumes you had the starter disable/enable connected during the installation. To return the starter to normal operation send S4 the text YourPIN relay off. If you leave your car with a valet, you can temporarily put S4 in master mode. As long as the valet drives slowly and for a very short distance, S4 will not send a moving notification. If the valet drives more than a few blocks, S4 will send you a moving notification. When you return to your car, send the S4 a guard mode text. 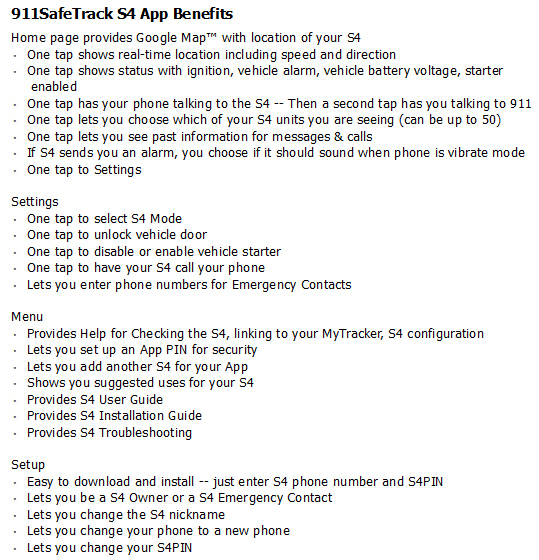 If your S4 notifies you with an alarm message and you want to alert 911 of the emergency but when you call the S4 you just get ringing but no answer, the S4 is temporarily out of the cell coverage area. Just send S4 a text YourPIN call. The cell carrier system automatically keeps trying to deliver the message. As soon as the vehicle is driven back into a cell coverage area, S4 will receive the message and will call your phone back so you can press # to make the 3-way call to 911. If you leave your vehicle at the shop for servicing or repair, place S4 in master mode. When the technician takes your car for a test drive, S4 will send you a movement notation with GPS location. If the technician disconnects the vehicle battery, S4 will send Vehicle battery disconnected notification. If you wish to see if the ignition is on and the engine is running, just ask S4 to send you status. The return message will tell you if ignition is ON or OFF and will show you the battery voltage. If the voltage is above 13.0V, the engine is running and the alternator is properly charging the vehicle battery. If a family member is traveling with your vehicle and is able to respond when you ask for status but is not responding if you ask for gps, send S4 a text YourPIN reset. This will cause the S4 to restart the GPS receiver. If you are going to have your vehicle towed and want to idle the S4, send S4 a text YourPIN move. S4 will not send you a movement notification until you return to either guard mode or master mode. S4 uses a very small amount of power (only ¼ watt) from the vehicle battery. However, if your vehicle will be parked for many weeks, you can unplug the 10-pin Cable connector from the S4. When you are ready to start driving the car again, just plug in the Cable.